Listening to Him Indoors play the piano at the weekends, he’s good! Lovey list. The beauty and positivity springs from the screen. Wow, that’s a great and long list, it lifted my spirits. That’s a lot to be thankful for! Thanks for sharing. Great list. I too love films, conversations with people I love, and sipping tea in bed. Waking up to the birds tweeting, having loved ones who are doing well, beautiful music, enjoying the simple things, but also enjoying traveling. . . There are so many items I can relate to in your list of 50. 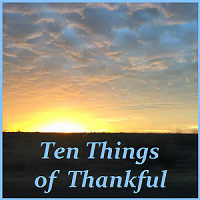 What a great list, and a great reminder that there are all sorts of little (and big) things to be thankful for! A wonderful list that brought a smile to my face. The little things are some times the things most grateful for.